Introducing the Byrne Willow Series of portable table top power technology. 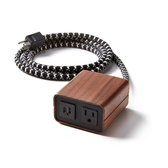 The Byrne Willow line offers users an elegantly designed, small form factor, portable power unit that provides 1 Power Receptacle with 1 USB-C and USB-A charging ports for your compatible mobile devices. This unit gives you the ability to extend power to those hard to reach wall outlets. No longer are the days of hassling to move furniture out from the wall to plug in your phone or laptop, or huddling around a corner in the kitchen due to short cell phone charging cables. The Willow brings the power to you with its stylish 72" long power cable. Now you can comfortably rest on your couch, office space, or work station around the house, without limitations of short mobile device cables. Not only can you charge 2 mobile devices at the same time, but now you can provide power for your laptop as well, all in one small 2.1" x 3.6" Monument Style power solution. "Manage the cord. Hide the cord. For years, that connection between wall and device has been a tangled source of frustration. So, we’d like to make a suggestion. What about elevating the cord into something special? Meet Willow: A single-power simplex with dual-port charging USB and limitless possibilities. 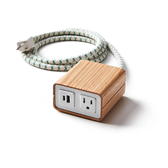 With a variety of stylish faceplate colors, sleek wood finish options and cotton braided cords, you’re sure to find just the right combination to suit any space."